From brewing beer, or kombucha, growing weed or checking the ph level of your aquarium you need to check the level with a tester. It's incredible in this modern age how accurate testers are and what a difference they can make. Getting your water at just the right level can me can mean a vast improvement in your beer's flavor, the yield of your plant or extend the life of your fish. So what is the best ph meter for testing? There are many options out there. There are handheld units which give you easy portability or desktop units which can produce some incredibly accurate results. If you are a home beer brewer, for example, you may only need a mid-range tester but if you are running a laboratory that is testing food for human consumption, you might just want to use one of the best instruments on the market. Whatever you choose, it's our firm recommendation that you never buy a cheap pH tester. Anything in the below forty dollar range is likely to no go the distance that you need. Users of cheap gear will find they might give a few readings initially before they become hard to calibrate or the cheap electrode parts dry out or cease functioning seemingly without cause. If you are looking for an all round, accurate and dependable ph tester then we recommend the Milwaukee range. We're featuring the MW102 Standard Portable pH / Temperature Meter as it is a standard yet affordable portable meter that produces accurate results. The Milwaukee brand is recognized by the brewing industry as having a reputation for producing low-cost meters on which you can expect durability and reliable reading. 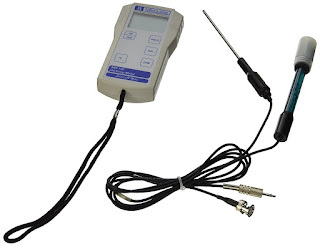 The MW102 is a microprocessor-based pH/Temperature meter with extended range (-2.00 to 16.00 pH). It features the standard Automatic Temperature Compensation ability, with automatic calibration in 2 points and ±0.02 pH accuracy. The Milwaukee device is pretty much ideal for anyone working on a fair budget who desires quick yet reliable measurements. 9 volt battery -The battery life is estimated by at 300 hours and it features an auto-off after 8 minutes of inactivity meaning you wont have to worry about replacing the battery in the middle of testing. This is a "fantastic tool to have in my brewing arsenal. I originally bought it for taking readings while kettle souring, but it's been invaluable as I dove deeper into water profile and mash pH adjustment. It's a bit more expensive than some of the cheaper meters out there, but you get what you pay for. Worth every penny in my book, and I regularly recommend it to those in the market for a high-quality meter." That's a firm recommendation then. If you are looking for a reasonably priced handheld ph Meter for testing water or wort then might want to reflect on the Apera Instruments PC60 Multi-parameter Tester. Apera's PC60 meter tests for pH, EC, TDS, salinity & temperature in an accurate, quick and reliable manner for most regular water solutions. Its versatility across the board means that it is suitable to use for a range of commercial and hobbyist adventures such as hydroponics, aquaculture, pools and spas, water treatment for beers, cooling towers and of course fish tanks. Featuring a multi-parameter probe that is easily replaceable, it sports Apera's 'Brush-Resistant Platinum Black' sensor, which means you can rely on the results for accuracy - provided of course you have properly cleaned and then calibrated the unit! The Apera is waterproof and dustproof and it naturally floats on water so you don’t have to worry you drop it into your fish tank or beer batch. A super handy lanyard is included and everything that the kit comes with easily fits in the portable carrying case which protects your gear when traveling or simply storing (see the above image. "The Apera PC60 instrument is super easy to use. It comes with everything needed to calibrate and feel confident in your readings. I even tested it against a 1000 TDS calibration solution I had and it read great! The display is easy to use and the backlight is very handy. I love that the "cap" is built in a way to put your liquid in, with a fill line, and closes securely around the pen. It then is able to calculate the different levels in the liquid. I no longer have to bend over and hold my pen in the nutrient reservoirs. One of the best features is the ability to set the TDS factor. This is important because PPM is calculated differently in different parts of the world. It gets very confusing." "Having previous experience with scientific research grade pH meters, I've maintained this pen in electrode storage solution between uses, and always rinsed the electrode with deionized water between measurement and before storage. With those precautions, both the pH and EC readings have remained on-point without recalibrating for more than a month at this point. When I do check the calibration, the instrument is never more than 0.05pH off-target." "The back-lit display is excellent for working under low-light (tap the power button once while the unit is on to activate), and the instrument fits perfectly into the top of 1-gallon water jugs. A note of warning, make sure the EC electrodes are not submerged in the electrode storage solution while not in use, only the glass pH bulb should be in the solution." "After having gone through 3 different cheap meters last year I decided to spend a little extra on this one. I am not disappointed. It's well worth the money. It's fast, accurate and covers a range of tests. I read the previous reviews and was somewhat skeptical. However, after using this product for a few weeks on a daily basis, I would recommend it to anyone. The LCD screen is a little small but I can read it without glasses. I found the instructions to be thorough and fairly well written. I think they must have updated their manual after previous reviews. I have backups just in case but after the first week, it became obvious I wasn't going to need them. By far the best meter I have used without spending a couple of hundred dollars." If you think those reviews sound fair, check out the price on Amazon. If you are looking for a fairly upmarket solution to measure your pH solutions then the tried and true Bluelabs brand has the measuring device you are looking for. The meter has two probes, a Bluelab pH Probe and a Bluelab Conductivity/Temperature Probe. When taking a reading, simply place them into the solution and the selected reading is displayed on the screen. Calibration of the pH probe is quite simple as instructions are supplied on the back of the meter and the easy push button method makes this one of the more simple meters to use. 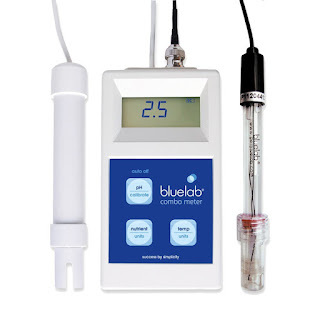 The pH probe is replaceable so you can use this meter for years to come and you should be able to do so as Bluelab offer a 5 year warranty on their product which should give you an idea as the quality of the product and the faith the brand has in it. Replaceable double junction pH probe included - make sure you look after them! How does Automatic Temperature Compensation work? Many of the higher quality meters use ATC functionality. This is when the unit compensates for the response of the pH meter's electrode with varying temperature. So ATC accounts for differing temperatures of things like a beer's mash. It is a measure of hydrogen in the solution and pH thus stands for 'potential hydrogen'. pH is a figure that expresses the acidity or alkalinity of a solution on a logarithmic scale on which 7 is considered neutral, the lower values are more acid and higher values more alkaline. Probes will wear out over time and you should expect that you’ll have to replace quality ones every 2-3 years even if you take good care of them. The probes should be safely stored in a pH storage solution to preserve their lifespan. If they are left in the open, the dry air will ruin their potential life span. So when buying your pH meter you should purchase a pH buffer or 'calibration kit'. This is why units like the Milwaukee MW102 comes with solutions but replacement calibration kits can be separately brought online. You might see them called 'reference solutions'. The Bluelab Combo Meter is very popular with horticulturalists and hydroponics enthusiasts (yes, even marijuana growers... which is fine given how many countries and states have legalized the sale of drug). It's is a good practice to regularly clean your pH electrode. This is because a film or coating known as the hydrated layer will otherwise develop on the glass bulb. It can cause inaccurate measurements and drifting or erratic readings if not managed properly. You can always use pH strips - handy for testing Kombucha brews!